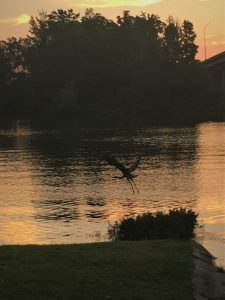 I issued the core of this Great Blue Heron Blog Post October 9, 2018. 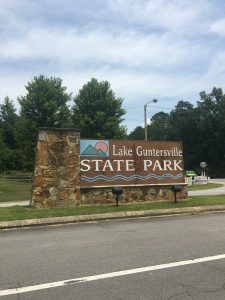 Its text, photos, reflections, and ruminations are applicable to each and every one of our 22 Alabama State Parks and their aggregate 74 square miles of beauty, magic, wonder, and awe. So, permit me to present the original Half-Day in Gadsden, Alabama Blog Post here, and then offer an Addendum with similarly themed photos from four of our northern Alabama State Parks beneath the original. Our daughter invited us to a social affair in Gadsden Saturday evening September 22. Because it’s a two-hour drive, we spent the night, reserving Sunday morning for getting a taste of Gadsden area Nature. 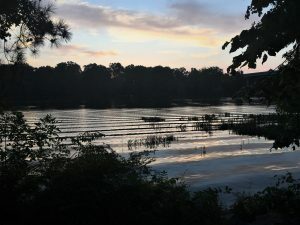 We walked at dawn along the Coosa River’s upper end of Lake Neely Henry, some 90 miles from Chattanooga and nearly 60 miles from Birmingham. The Coosa’s headwaters tap far southeastern Tennessee and the northwest corner of Georgia. 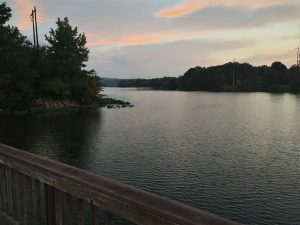 The Coosa begins at the confluence of the Oostanaula and Etowah rivers at Rome, Georgia. 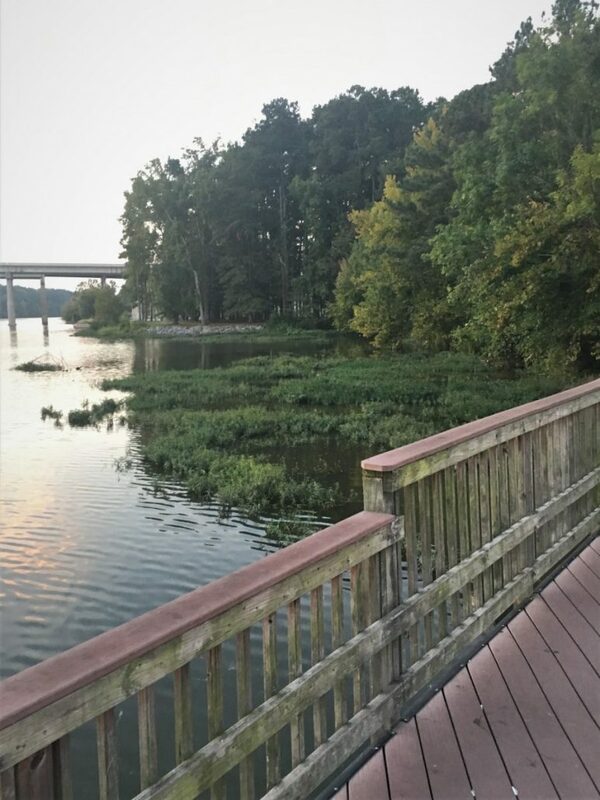 It joins the Tallapoosa River just south of Wetumpka, Alabama above Montgomery to form the Alabama River, then merges with the Tombigbee to create the Mobile River as they empty into Mobile Bay and the Gulf of Mexico. 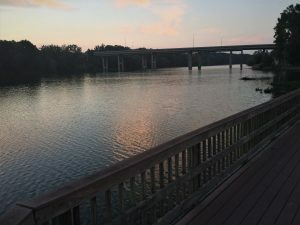 The Coosa reaches some 280 miles from Rome, Georgia to the Wetumpka area. 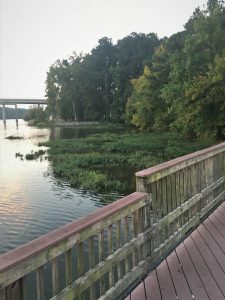 The total distance from headwaters to the Gulf is 808 miles (Mobile River, 45; Alabama River, 319; Coosa River, 280; Etowah River, 164). Imagine how many wonderful dawns and sunrises greeted other observers along those 800+ miles that mid-September morning. Lower left and lower right, respectively, look upstream and down from a fishing pier near our accommodations from our west-bank vantage point. A tighter view southward captures the shore-side mats of vegetation, harboring all manner of fish, reptiles, amphibians, birds, and other critters. Again, imagine the menagerie of life finding shelter and food along those 1,600 (two shores) miles! A perfect walking trail extended south along the shore. A departing fishing boat brought corduroy reflections of the brightening eastern sky. The view is a little south of due east. A bit further along the trail I was too slow with my camera to catch the stilt-legged great blue heron fishing at the end of this storm-water drain-way. The bird had just lifted when I snapped the shutter. The view is directly east. I thrill at every great blue heron, especially one backlit by the dawn of yet another incredible late-summer day. I know, I’ve seen far better photographs, yet being the one who pressed the shutter, I recall the magic of the moment every time I peek at the magnificent bird’s first-light flight. I accept this encounter as the gift that it was. I’ve recounted many times the story behind my considering the great blue heron as my deceased Dad’s avatar. In form of a great blue, Dad wished me farewell on a bitter cold mid-February sunrise in the central Appalachians… the day of his memorial service. Still today, when a great blue makes an appearance, I consider it a visit from Dad. It is he who planted the lifelong seeds of my Nature passion and deep appreciation. 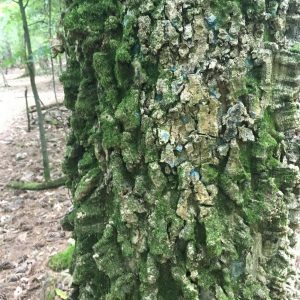 The trail also passed through a fertile floodplain forest of mixed hardwood and loblolly pine. The trees expressed the rich site via their height. Height of dominant and co-dominant trees at a selected base age is a common forestry metric for gauging inherent site quality. We used height at base age 25 years to register site quality in the forests of central and south-central Alabama when I managed forestland for Union Camp Corporation back in the early 1980s. For the 100,000 acres we owned north of Montgomery site quality averaged 60-65 feet at age 25. For the 220,000 acres below Montgomery, site quality averaged 80-85 feet. Those are some of the South’s most productive pine forestlands. Sure, southern bottomland along the Mississippi River, for example, is more productive, yet generally those bottomland sites do not support pine forests. Here’s Judy, my early morning (and lifetime) companion, along the trail in the Coosa mixed pine and hardwood stand. After a leisurely breakfast, we toured our daughter, her two sons, and son-in-law along the same river-side trail. We all enjoyed our Coosa River explorations. We departed our hotel and headed to Noccalula Falls Park. I had no idea what to expect. 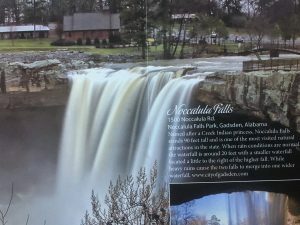 From Wikipedia: Noccalula Falls Park is a 250-acre public park located in Gadsden, Alabama, United States. 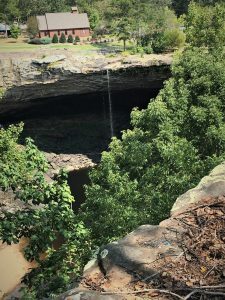 The main feature of the park is a 90-foot waterfall with a trail winding through Black Creek Gorge at its base past caves, an aboriginal fort, an abandoned dam, pioneer homestead, and Civil War carvings. We purchased tickets (senior discount — one of the advantages of getting older!) and posed with the boys at an autumn-decorated display tree. 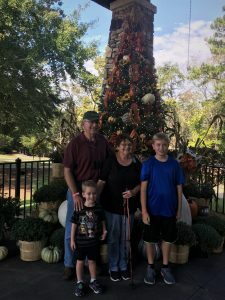 We spent a couple hours exploring the Park via a ride on the narrow-gauge railroad and walking within the petting zoo, viewing various other wild animals on display, strolling through an evolving botanical gardens and pioneer village, and stopping at the falls overlook. Because the this late September day presented near record heat, we elected to save the Gorge trail for another day. 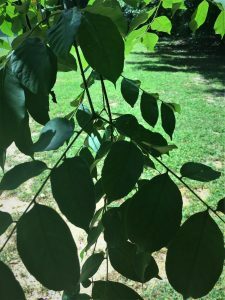 I relented reluctantly, knowing that I was foregoing the kind of photos I normally take to populate these Blog Posts and stimulate reflections on Nature. 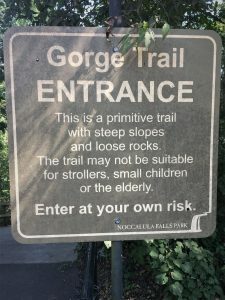 Another factor contributed to my willfully postponing a hike into the Gorge. The brochure photo below right shows the Falls in full glory with the stream at bank-full. Below left is the photo I snapped during our visit — a mere trickle! A persistent Bermuda high had limited August rainfall to below average, and essentially blocked significant precipitation during the first three weeks of September. I want my drop into the Gorge to pay dividends in form of visual, tactile, and auditory rewards. So, another day, perhaps mid-winter once the rains return, when we venture back to Noccalula Falls. 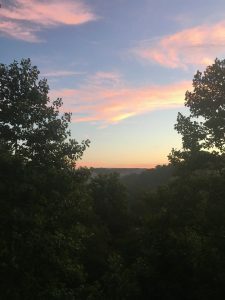 Philosophical Musings on Wonder, Awe, and Magic — I have seldom witnessed a new day dawning that did not serve to inspire and humble. That morning along the Coosa was no exception. The simple power and beauty of night retreating to make way for a rising sun. I puzzled over what I had just witnessed: darkness racing westward, leaving a photon-vacuum in its wake… or light rushing in from the east. I recall the sage who explained that there is no such thing as darkness, which instead is only the absence of light. The same person observed that cold is merely the absence of heat. And hate simply the void left when there is no love. I presume that the great blue heron had not pondered these things. He (the pronoun I employ for all great blues given the aforementioned avatar explanation) simply felt hunger… the absence of breakfast in his belly. Hew noticed only that darkness had retreated sufficiently for shore-side fishing. 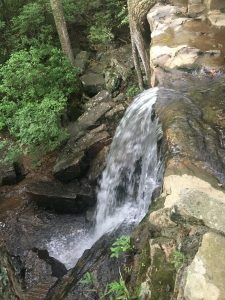 I wondered, too, about the scale of watersheds, that is, contrasting the trickle at Noccalula Falls to the apparent full pool at Lake Neely Henry. The Falls quite clearly manifests the August through mid-September local rainfall deficit. The Coosa at Gadsden reflects a much larger drainage basin, far longer time period, and several hundred miles of flow. Local deviation from average precipitation means little to the larger Coosa. Ample August rains in northwest Georgia could have compensated for the local shortfall. I see the same relative implications and consequence for our lives. Day to day the local impacts us. Only over the longer haul do the ebbs and flow equalize and attenuate. The river that is our own life eventually completes its journey to the sea, whatever its length and character happen to be. Droughts and deluges may alter the flow, yet the journey is defined and shaped by aggregate influences. Our charge is to optimize, to the extent we can, our individual wanderings and the flow of those who share the life journey with us, even if only fellow travelers who are with us for just some stretch of the way. Nature instructs that whether we are the Coosa or the creek at Noccalula Falls, we have a journey and destination. Unlike the drop of rain, driven and directed only by chemistry and physics, we have dimensions that give us will, passion, purpose, and alternatives. Ours is a higher cause, if only because we can choose. The raindrop falling on a northwest Georgia hill top has no way to choose. What I want us to do is understand the magic, wonder, beauty, and awe of Nature and appreciate that we share an obligation to steward this Earth sustainably. 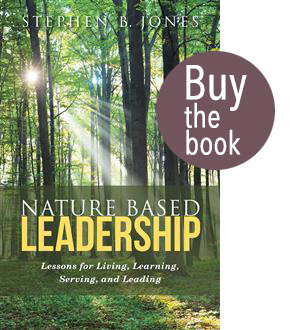 From Nature Based Leadership — Individuals, enterprises, and society broadly must awaken to our obligation to wisely steward our environment – from within our local community to globally. 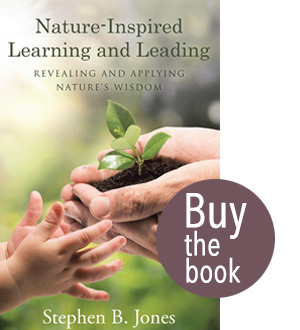 From Nature-Inspired Learning and Leading — Recognize the irreconcilable burden of Earth stewardship we bear as individuals and enterprises. We have this one chance to get it right. 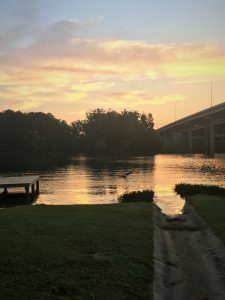 If we don’t, the Coosa will continue to make its way to the Gulf of Mexico again, and again, and again, and again, and again… absent human appreciation for daily dawnings along its beautiful shoreline. A river doesn’t care who stands at its banks — never has and never will. Eventually I will have visited all 22 State Parks. At the moment I can draw relevant text and photos from only four. DeSoto — Here’s dawn at DeSoto — how’s that for daybreak Magic! Rainfall near DeSoto had been adequate when I visited, permitting one of many small streams to tumble a minor waterfall with as much volume as the advertised Noccalula Falls. Timing is everything. Joe Wheeler — Not all beauty derives from dawn’s special colors and warmth, nor from water’s trek to the sea. Here’s a well-adorned hackberry, sporting a fine green coat of algae. 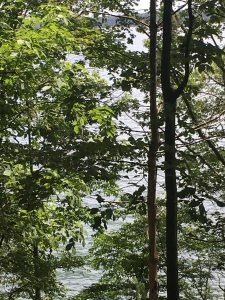 And there’s the water of Lake Guntersville from the forested bluff where a DeSoto hiking trail skirts the highland! 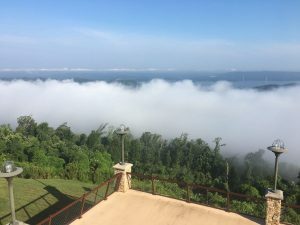 Lake Guntersville — The early morning sun is beginning to burn its way through the valley fog below the Lodge patio. And the image is burned and lodged in my vault of pleasant Alabama State Parks memories. A fine dawn without a palette of colors. And the warmth of a welcoming sign! Monte Sano — The sun’s gift to us extends from dawn to dusk, even here at its midday zenith. 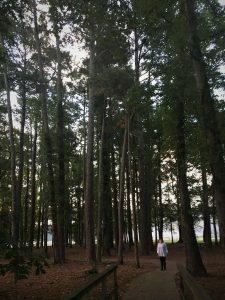 So many of our Alabama State Parks have stories to tell. 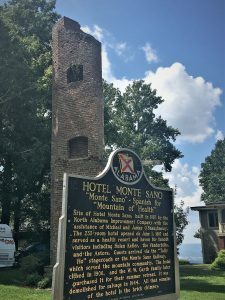 Whether like the old mill at Noccalula Falls (not a State Park) or the hotel atop Monte Sano, we are not the first to experience the exquisite joy of visiting special places. Our Parks are special places filled with Nature’s beauty, magic, wonder, and awe. Visit and enjoy!